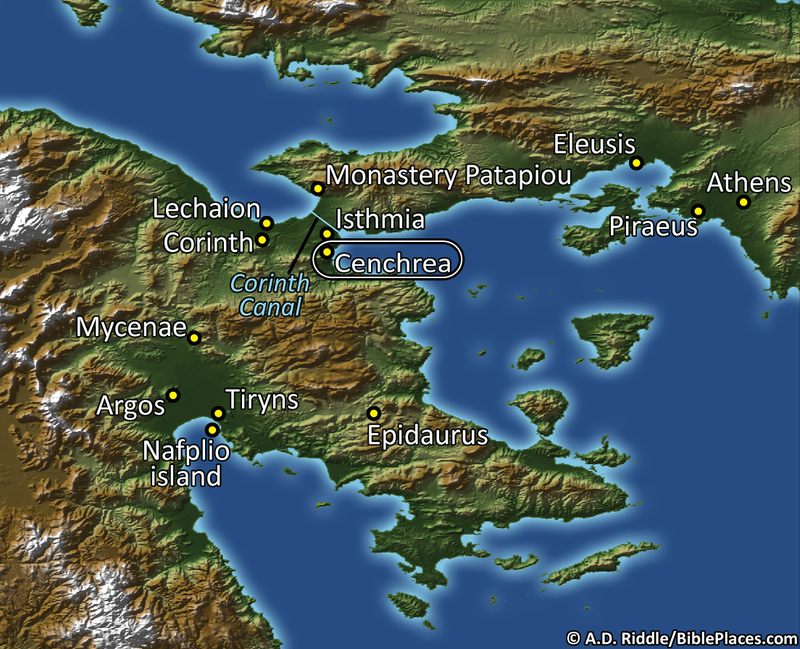 The city of Cenchrea (or Cenchreae) was a port city near the Corinthian isthmus in Greece. Paul was on his second missionary journey and had just completed his 18-month stay in the city of Corinth. When he passed through Cenchrea, he was reaching the end of his journey. After this, he made a short stop at Ephesus, and then continued on to Caesarea, Jerusalem, and finally Antioch where he started his journey. Cenchrea is also mentioned in Romans 16:1 where Paul mentions a lady named Phoebe who served the church in that city. In the photograph below you can see the harbor of Cenchrea. This city served as the eastern port of Corinth, which explains why Paul passed through here on his way back to Jerusalem and Antioch. Virtually nothing has been found of the main city of Cenchreae, which lay northwest of the harbor, because during five seasons of excavation from 1963 to 1968 the government restricted work to the harbor except in 1966. ... The picturesque harbor thus far excavated, dates to the Roman period. ... The Roman harbor originally contained about 1600 feet of shoreline and was 98,000 square feet. In comparison with other Greek and Roman harbors, this one was rather small .... Two large breakwaters, were constructed around a natural bay. The modern shore is about 7.5 feet lower than during New Testament times, due to seismic activity. The harbor's breakwaters or moles are completely submerged. Pottery and coins give evidence to a city whose commercial life, prosperity, and general status was inextricably tied to Corinth's. Almost all the coins uncovered have been of Greek mintage or from the eastern Mediterranean, confirming that Cenchrea's commercial significance was the link it provided between Corinth and the east. This map and photograph, along with over 800 other images, are available in Volume 11 of the Pictorial Library of Bible Lands, which can be purchased here for $34 (with free shipping). 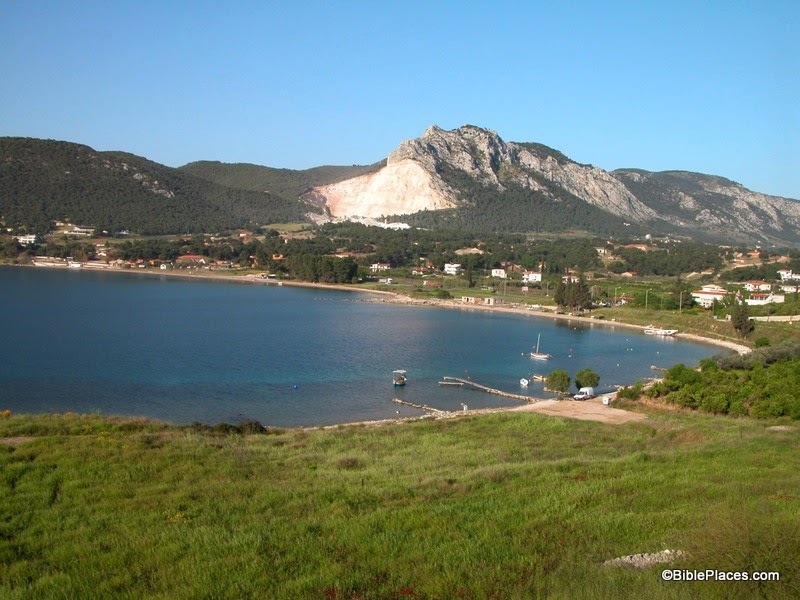 Another photograph of the harbor at Cenchrea can be seen here on the BiblePlaces website. Ferrell Jenkins has a picture of the harbor available on his blog here. For other posts in our series on "obscure sites in the PLBL," see here. The excerpt is taken from John McRay, Archaeology and the New Testament (Grand Rapids: Baker Book House, 1991), pp. 336-337.